Though spring is dawning elsewhere in Turkey, shepherds in a region known as the "Siberia of the Mediterranean" continue to struggle to keep their flocks fed and healthy in the face of bitter cold. At sunrise, shepherds lead their flocks to Mt. Berit, trekking miles through the cold of Göksun, in the south-central Kahramanmaraş province. The sheep and goats graze wherever they can find a patch of green, as snow still covers much of the ground in Ericek, an area some 1,000 meters above sea level. Kangal shepherd dogs, famed as herders' best friends across Anatolia, protect livestock and shepherds alike. Tough, large and very strong with sharp sight and hearing, Kangals prove a match to most predators who might threaten the herd. Taking a break from their duties tending the flock, shepherds fill their kettles with snow, brew some tea and have a simple lunch. 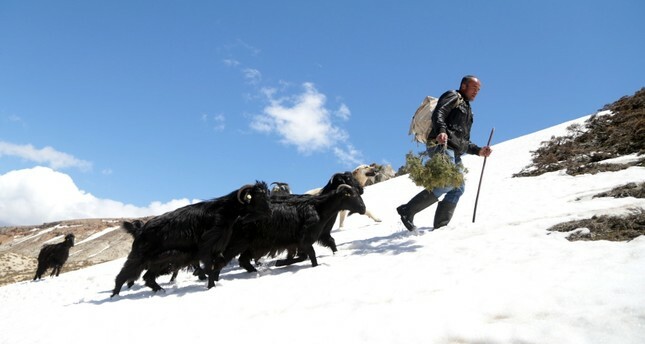 Hüseyin Gürbüz, a local shepherd, says his job can be easy or hard, depending on the season. "Here we're in the Siberia of the Mediterranean, the highest point in Kahramanmaraş," he told Anadolu Agency. "There's always snow here, sometimes up to 3 meters. But everything is definitely much easier in the summer."